Professional Regulation Commission once again warned the applicants and various professional test takers against the fixers lurking around. It has been recently reported that there are many queries of various professional about a confirmation of a PRC official’s identity through Facebook. 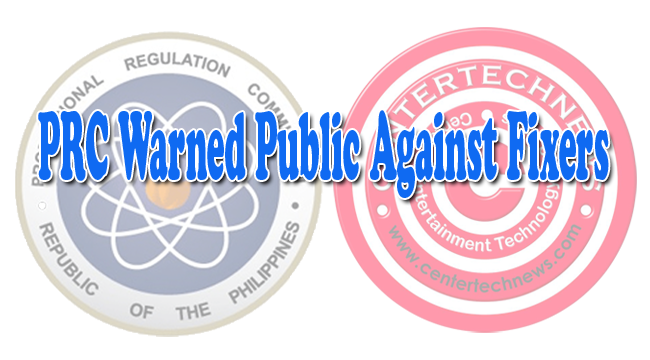 As posted by the PRC in their official web site, the modus operandi of the fixers is to assume themselves as PRC employees or officials then they would assure the examinees and their families that they can make a way to guarantee that the examinee will pass the licensure examination or they would facilitate the validation of license if they will be paid at a given price. The meetings and places for pay off are conducted in places outside the PRC premises. The professionals making queries had identified Shyller Ralph Hernandez and Daryl Diguidig as the fixers trying to pose as PRC employees and try to transact constantly with their unsuspecting prey. Hernandez and Diguidig were positively identified by the Commission’s Human Resource Division as non- PRC employees. It was reported that the two identified fixers are said to have demanded PhP1,500.00 to PhP2,500.00 and directed the victims to submit documents to validate the examinee’s PRC license. If the victim fails to comply, they are threatened to have their PRC registration canceled together with penalties. The PRC made clear that they do not maintain an account to any social network. PRC also reminded the examinees and professionals that the only places they can do official transactions with the Commission are the PRC I.D. Renewal Center in malls, PRC mobile services, all PRC Offices namely Central, Regional and Satellite and transac only with authorized PRC personnel.